A recent paper by Stephen Hawking has created quite a stir, even leading Nature News to declare there are no black holes. As I wrote in an earlier post, that isn’t quite what Hawking claimed. But it is now clear that Hawking’s claim about black holes is wrong because the paradox he tries to address isn’t a paradox after all. It all comes down to what is known as the firewall paradox for black holes. The central feature of a black hole is its event horizon. The event horizon of a black hole is basically the point of no return when approaching a black hole. In Einstein’s theory of general relativity, the event horizon is where space and time are so warped by gravity that you can never escape. Cross the event horizon and you are forever trapped. This one-way nature of an event horizon has long been a challenge to understanding gravitational physics. For example, a black hole event horizon would seem to violate the laws of thermodynamics. One of the principles of thermodynamics is that nothing should have a temperature of absolute zero. Even very cold things radiate a little heat, but if a black hole traps light then it doesn’t give off any heat. So a black hole would have a temperature of zero, which shouldn’t be possible. Then in 1974 Stephen Hawking demonstrated that black holes do radiate light due to quantum mechanics. In quantum theory there are limits to what can be known about an object. For example, you cannot know an object’s exact energy. Because of this uncertainty, the energy of a system can fluctuate spontaneously, so long as its average remains constant. What Hawking demonstrated is that near the event horizon of a black hole pairs of particles can appear, where one particle becomes trapped within the event horizon (reducing the black holes mass slightly) while the other can escape as radiation (carrying away a bit of the black hole’s energy). While Hawking radiation solved one problem with black holes, it created another problem known as the firewall paradox. 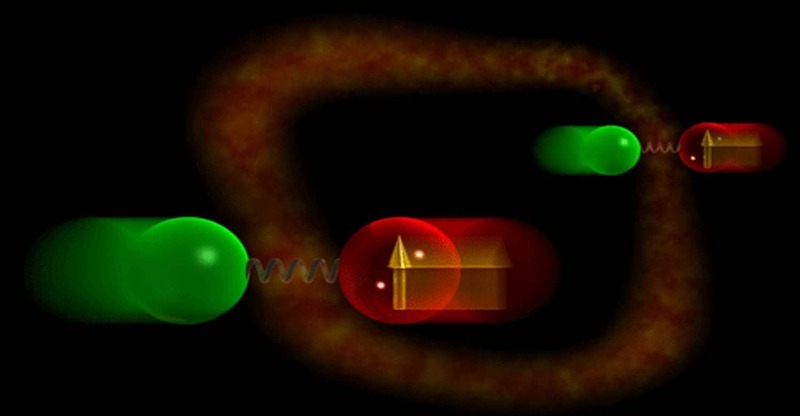 When quantum particles appear in pairs, they are entangled, meaning that they are connected in a quantum way. If one particle is captured by the black hole, and the other escapes, then the entangled nature of the pair is broken. In quantum mechanics, we would say that the particle pair appears in a pure state, and the event horizon would seem to break that state. Artist visualization of entangled particles. Credit: NIST. Last year it was shown that if Hawking radiation is in a pure state, then either it cannot radiate in the way required by thermodynamics, or it would create a firewall of high energy particles near the surface of the event horizon. This is often called the firewall paradox because according to general relativity if you happen to be near the event horizon of a black hole you shouldn’t notice anything unusual. The fundamental idea of general relativity (the principle of equivalence) requires that if you are freely falling toward near the event horizon there shouldn’t be a raging firewall of high energy particles. In his paper, Hawking proposed a solution to this paradox by proposing that black holes don’t have event horizons. Instead they have apparent horizons that don’t require a firewall to obey thermodynamics. Hence the declaration of “no more black holes” in the popular press. But the firewall paradox only arises if Hawking radiation is in a pure state, and a paper last month by Sabine Hossenfelder shows that Hawking radiation is not in a pure state. In her paper, Hossenfelder shows that instead of being due to a pair of entangled particles, Hawking radiation is due to two pairs of entangled particles. One entangled pair gets trapped by the black hole, while the other entangled pair escapes. The process is similar to Hawking’s original proposal, but the Hawking particles are not in a pure state. So there’s no paradox. Black holes can radiate in a way that agrees with thermodynamics, and the region near the event horizon doesn’t have a firewall, just as general relativity requires. So Hawking’s proposal is a solution to a problem that doesn’t exist. What I’ve presented here is a very rough overview of the situation. I’ve glossed over some of the more subtle aspects. For a more detailed (and remarkably clear) overview check out Ethan Seigel’s post on his blog Starts With a Bang! Also check out the post on Sabine Hossenfelder’s blog, Back Reaction, where she talks about the issue herself. Very nice! That was very helpful. In a matter that is dependent on the agreement of many subtleties, it’s hard to make a believable argument when you gloss over the subtle aspects. It’s annoying when a simplification demands that important yet complicated details are left out. How does general relativity say “no firewall”? A post about the role of the equivalence principle in the ex-firewall paradox would be very illuminating! Actually, that’s definitely *not* the “central” feature of a black hole – it’s more of the edge. Ahahaha. Get it? Get it? Central? Would not spaghettification prevent the solution of impure Hawkings Radiation? If a particle is trapped within the event horizon, wouldn’t that increase the mass slightly, instead of reducing it? Not if it is an anti-particle when it gets converted into energy when it collides with a particle. Nope. Anti-particles supposedly have mass too, not anti-mass; energy has mass (or ‘is’ mass). I don’t really understand the mass decrease either though, I guess it has to do with the ‘borrowing’ of energy (quantum fluctuation) for the pair to appear in the first place, but why does it have to be the BH that loses mass, and not the rest of the universe? I don’t understand it either, but I’ve always been under the impression that the particles had to borrow energy from the gravitational field of the black hole (the strongest energy source in their vicinity) in order to appear. Most of the time they destroy themselves and that energy is given back. But if one of them is absorbed into the black hole and the other one isn’t, then the mass of the black hole has to decrease in order to permanently lend energy to the escaping particle. It doesn’t really make a lot of sense to me, but that’s what I remember reading. what is the problem? and where is QM on that one? Moreover, if the object at the centre of that space-time warp is not a singularity, thinking in Newtonian terms, and of myself as a photon, I am trapped within earth’s event horizon, I can’t reach escape velocity but I can still run, walk or jump so I am still preserved in QM terms just not detectable beyond the limits of my movement. I believe what Stephen Hawking is referring to is that there are no Black Holes if there is Imaginary Time. The two states of Spin would be an example of another dimension of time ( One could regard Information in General as the Second Dimension of Time, as it really can’t be accounted for using 3 space Dimensions and One Time Dimension—Likewise you can see this Duality in Time itself- It is just Information, and although you can claim it is Geometrical because the hands of a Clock move to different angles, it is independent of the Space Dimensions and has that “Information” feel). So the argument that about the Pure states is just a bit too contrived. Mind you Hawking will have to say for himself what he means, and this is my own theory of time, but if you look at two dimensions (at least two dimensions) that are really just information, and you take that those two dimensions have non-Commuting operators, then you can propose an Experiment that would search for a symmetry, a conservation and a particle between those two dimensions–so you can prove it experimentally. So it is my opinion that Brian’s theory is a bit old fashion, a bit of history, and not at all correct. To risk being a bore, I would like to point out that time becomes space-time with one other dimension in Special Relativity (the Lorentz Transform), but the truely amazing thing that Hawking showed was that the Horizon (which is an Area!!! that is proportional to the Entropy(Information?)) is proportional to the Information in a Black Hole—So if you take Information as being that Imaginary time, something fantastic is being revealed (to be a bore again, it may in fact prove that there are two dimensions of time, in that the time we call clock time acts like a line, the Imaginary time like spin up, spin down would act like a line) their product is an area. Anyway given this, I think Brian’s idea is wrong, except in that the pairs he talks about would also contain information and this points to the real power in Brian’s idea—The whole Black Hole Horizon is a lot more complicated than we are thinking right now–so go for it Brian. Any medium that supposedly supports wave motion, should also be able of supporting whirlpool or vortex motion. If the motion is rotation , or movement in a closed circuit, as in vortex motion, then the inertia will be localized, and thus have momentum. The distinguishing characteristic of the so- called blackholes is their Localized Persistence of Individuality, and this is the same as vortex motion. On the other hand, a vortex ring , if distorted from the circular , or elliptical will spontaneously revert to it’s original form , displaying persistence of individuality, and memory of it’s original form. The so called event horizon of a blackhole is the interface closed circuit of vortex motion, within the medium, the resulting reaction not allowing light to escape, as it is no longer a wave, in the normal sense, but still an energy source, contributing to the inertia and momentum of the vortex, or so-called blackhole.